It's interesting to me that our kids have very little experience eating watermelon with seeds in the middle... but for the past year I really try to avoid the seedless watermelons- they have such little taste compared to the watermelons with seeds. Anyway! 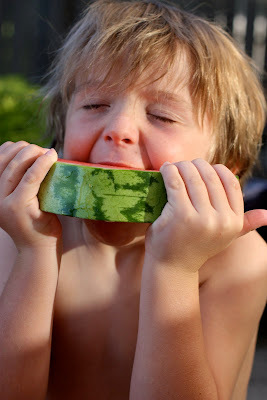 Leave it to Grandma to teach the kids how to properly eat a watermelon with black seeds. They were both pretty excited to find a snail... the poor snail was probably not as excited.